The U.S. Space & Rocket Center's Rocket Park has changed over the years, even since I started visiting. Several rocket engines have been moved indoors, as has the Saturn V. The Titan II has been taken off display. I have photos of these artifacts on this Website, and these artifacts are still visible in the historic Google Earth imagery. Click image for a 2188x1688 pixel version of this image in a new window. Capture and annotation by heroicrelics. For the most part, I don't know the dates on which the artifacts were relocated; the best I can do is examine the dates of the last photos I took of the artifact in its old location and the first photo I took in its new location. Of course, I didn't necessarily take photos of the artifacts on every visit, and probably would have only taken new photos when I noticed that they had moved. I was actually surprised that the V-2 engine was still displayed outdoors as late as my first visit to the USSRC: I don't specifically remember seeing it outdoors and I didn't purposefully photograph it, so I assumed that the aerial imagery above was captured prior to my first visit. However, upon seeing it in the photo above, I looked more closely at some of my old photos of artifacts near the V-2 engine's position, and I did find one such photo from July 2002. By October 2002, the V-2 engine had been removed from the Rocket Park (although part of its stand had not yet been removed), so it's no wonder that I don't remember it being on display outdoors. The A-7 engine was first moved to a protected area next to the building sometime between June 2003 and June 2004. It was on display inside the museum by June 2005. The last photo I have of the Nerva was taken in June 2004. 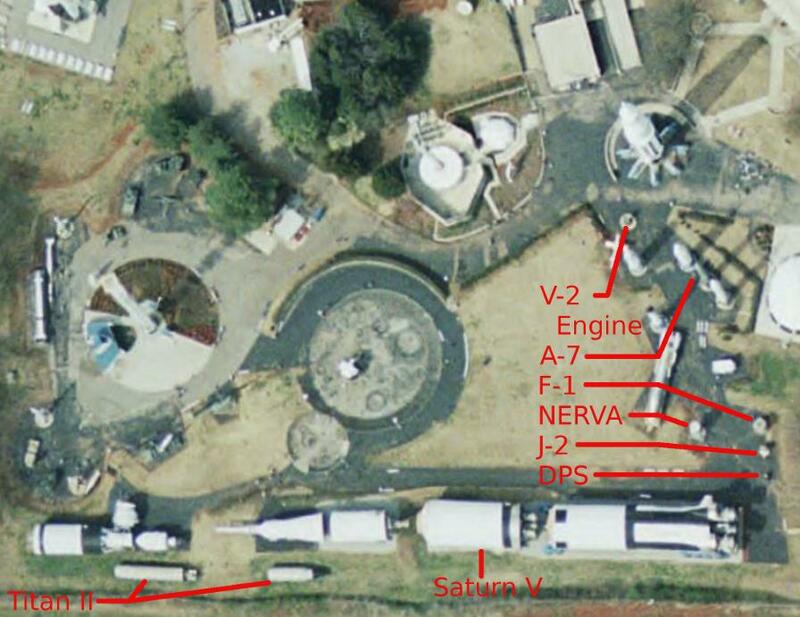 This NERVA engine was installed in front of Marshall Space Flight Center's Building 4205 sometime between late 2009 and mid-2010. The J-2 engine was first moved to a protected area next to the building sometime between June 2003 and June 2004. It was on display inside the museum by August 2005. The DPS engine was moved indoors sometime between June 2003 and June 2005. The Saturn V was moved to the Davidson Center in 2007, starting with the "Rocket Roll" ceremony on July 10. The Titan II was taken off exhibit and moved first to the far west parking lot sometime between June 2004 and August 2005. It was later moved to near the bus barn.